Have you ever wondered how toothpaste gets into the tube? How stripes get on a candy cane? More than just a travel guide, Watch It Made In the U.S.A. helps you experience firsthand the products, companies, technology, and workers that fuel our economy. You and your family can visit some of the best-known American companies and see how they make their products. 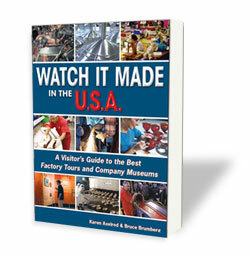 Avalon Travel Publishing is pleased to announce the fourth edition of Watch It Made in the U.S.A.: A Visitor's Guide to the Best Factory Tours and Company Museums. Along with updates throughout the book, the fourth edition has added 60 more factory tours and company museums, including the Ford Rouge plant in Michigan, CNN's studios in New York City, NASA sites in Florida and California, the National Corvette Museum in Kentucky, Orvis (fly-fishing rods) in Vermont, and Sony Pictures Studios in California. If your family has ever wondered how toothpaste gets in the tube, how the fortune gets into the fortune cookie, or how such big flavor gets into one small jellybean, this guide has the answers. Factory and company museum tours are the perfect addition to any family vacation or business trip. With hundreds of tours to choose from, families have a special opportunity to sample free ice-cream at Ben and Jerry's, get a souvenir baseball bat from Louisville Slugger, receive a pack of crayons from Crayola, or munch on a bag of "Belly Flops" from Jelly Belly's jellybean factory. For the next family vacation or business trip, take a copy of Watch It Made in the U.S.A. to add a unique and memorable experience to your travels. Have fun, learn something, and get cool free stuff. Authors Karen Axelrod and Bruce Brumberg have traveled across the U.S.A. to "kick the tires of the American economy" by enjoying all the amazing factories that make some of most popular and recognizable products in the world. This husband-and-wife team, as seen on Good Morning America, is available for interviews—they'd be happy to share how and where you can celebrate the products we make here in the U.S.A. When not traveling, they live with their children, Hilary and Gregory, near Boston, MA. "...take time to visit one of these factories—the whole family will enjoy the tour." "Unusual travel opportunities, and they're closer than you think..."